Of course, I know where the deacon’s line of thinking stems from. It has flooded modern evangelicalism for decades now. 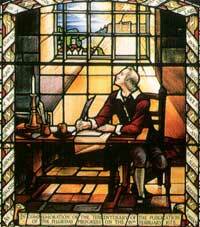 The church growth\seeker-sensitive movement thrives on a non-doctrinal paradigm of Christian pragmatism. Don’t give church-goers what they need, give them what they want – in liberal doses. This pragmatic approach may attract multitudes of church-goers but does little to produce true disciples of Christ. So the wants of a typical church filled with ‘seekers’ (those who haven’t made any kind of commitment to Christ but are interested) do not match those in the church who are truly Christians. The focus of seeker-sensitive churches sits squarely upon the seeker and his carnal wants instead of the classic doctrines of the bible: teachings such as man’s sinfulness, God’s wrathful judgment against sin, the means of salvation and sanctification he has provided through Christ’s atoning work on the cross and the heart-changing ministry of the Holy Spirit. I suppose congregants who have no zest for doctrine and theology are considered ‘babes in Christ’ who need to be nurtured in a pastel colored nursery by coochie-coochie-coo care-takers that speak condescendingly about moral platitudes from the life of King David. Unfortunately, seeker-sensitive churches often have no plans to move toddlers out of the nursery. They keep them content with toys and entertainment. With this picture of today’s church-goers burnt into the minds of so many pastors, teachers and Sunday School educators in all of evangelicalism It should be of little surprise that non-doctrinal books consistently top the sales charts. I present to you the latest Christian bestseller that promises life-changing results for every one blessed enough to get their hands on a copy. And yes, this is the volume our little book club will be reading this summer. When my friend presented the book One Month to Live by mega-church Pastor Kerry Shook (and his wife Chris) to my class last week I initially reacted with indifference. I had never heard of it, so I was ignorant of its contents. I trusted his judgment and left it at that. However, several red flags have popped up as I’ve taken the time to look into it more deeply. Red Flag#1: The sub-title. ‘Thirty Days to a No-Regrets Life’. Hmm, I’m suddenly have flashbacks to Rick Warren’s Purpose Driven Life which was accompanied by a 40 Days of Purpose campaign. I’m sure there’s no correlation.. wait. What’s this? 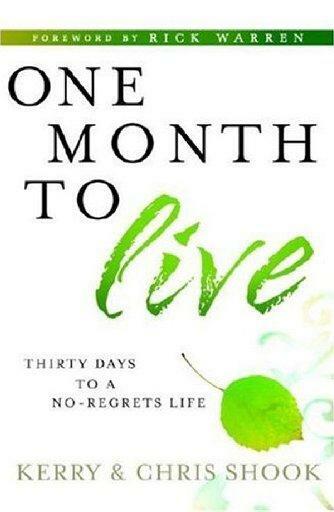 The official web site for the book has a section dedicated to the One Month to Live Challenge. This challenge takes three forms: Personal, church-wide and city-wide. Apparently over 3,500 hundred churches have participated so far. Wow! I had no clue this kind of movement had taken place. It has become wildly popular. Apparently, it’s been right under my nose. Check out this report form The Early Show on CBS about a whole town that took the challenge sometime last year. Clinton, OK is right down the road from where I live! Red Flag#2: The forward of the book is written by the crown prince of purpose-driven pragmatism himself, Rick Warren. Not a good sign. Not only that, it has received written endorsements from Bill Hybels and Joel Osteen. Together these three influential pastors comprise the Three Amigos of Artificial Church Growth. Red Flag#3 – The premise. The synopsis of the book appears to be focused on living life without regretting things left undone or unsaid. it seems to embrace a ‘bucket list’ mentality, only with a shiny coat of Christian veneer applied. I hope this doesn’t turn out to be the case. If so, that makes One Month to Live a book that belongs in the ‘Inspirational’ or ‘Self-Help’ section of the bookstore. A no-holds-barred life of doing everything we’ve always wanted to do runs against the grain of the life of self-denial and self-sacrifice that Christ demands of his disciples. The flags are up and waving frenetically in my mind. I’m not making any judgments yet, but I’m bracing for disappointment. Maybe One Month to Live will surprise me… but probably not. The question I have for my readers is this: Has your church or your community read through this book? Have you read it on your own? If so, please feel free to share your insights with me in the comment section. I would love to have a good idea how bumpy the terrain will be this summer. Like you, I’ve been completely ignorant of this book’s existence and especially of the apparent popularity of it. The problem isn’t our desire to live this way; rather, it’s taking a good thing/desire God’s Spirit gives to us, and using them to accomplish a sinful and self-centered craving to quiet our consciences…sinful, precisely because these books and methods don’t PRIMARILY promote putting God’s supreme glory on display. Anything less feeds our existing and tragic condition as glory-theifs. Your comment demonstrates that God’s grace has granted you much wisdom from your experience with the self-help culture. Superb and profound insights! Thank you very much. Hehehe… Trust me, my shields are up and set to maximum. Could be an interesting summer! OK I wish this guy had actually read the book before he started bashing it. We finished the 6 weeks today…and I found it spiritually uplifting! We as Christians can make such a difference in the lives of those who do not know the Lord or those who need to start living for the Lord. We have a lot of influance on others and we need to use the gift God has given us. Where does the motivation for our love for others come from? If we donot understand God’s love for us then we can not properly love others. We have to choose each day to love completely. What prohibits us from forgiving others the way God has forgiven us. If you had one month to ive who would you need to forgive? Who would you need to ask forgiveness from? What allows us to find joy in the midst of our trials? Your pain may not be just about you, it might be preparing you to bring comfort to someone else who is facing the same struggles. Our pain is not pointless. Our lives are temporary, but they can make an eternal impact on others. Jesus tells us to invest the one and only life He has given us to live. We are to store up treasures in Heaven not on earth. The last thing that the Shooks share in the study is to begin reading the Bible through. Just aas Jesus said, man lives on the very words that come from the mouth of God. Commit your lifestyle to filling yourself with God’s Word. I hope this helps someone sitting on the fence concerning the book. In doing a google search on Life Without Regret, I came across this site as well as the Amazon site for the Shook’s book, which gave me a chance to look at the topics to discuss. Anyway – I was just looking for information on life without regret and just found another humorous example of Christians bashing each other. I wonder if you ever regret that. My church has just started doing this 30-day program and though I feel the IDEA is transformational if applied, I am skeptical about the hype surrounding the book/program. Coming out of a long history of self-helpism, books like these set off my alarm-system. I have lived enough years to know for myself that only Jesus can truly change my life. I also have to say that the fact that it is recommended by Rick Warren also causes me some concern. I wonder whatever happened to the popularity of books by people such as Lewis, Schaeffer, Spurgeon, etc.